This is a fast moving and interesting lecture. Great Courses always seem strong on the classics topics and this is no exception. The professor is entertaining and easy to listen to. I added a bunch of the free The Great Courses lectures to my reading list. This was one of them. Overall the lectures were mildly interesting and worth the price (free). These free lectures are single lectures from longer series of lectures and often refer to other material in other lectures. All of these were too short to be very useful. These are also all in lecture format (as opposed to book format). For me the lecture format is harder to absorb than book format. This lecture was a very brief overview of the life of a poor roman. I had already read a lot about Rome and find integrated history much easier to absorb than topic histories. A bit of a droning presentation. 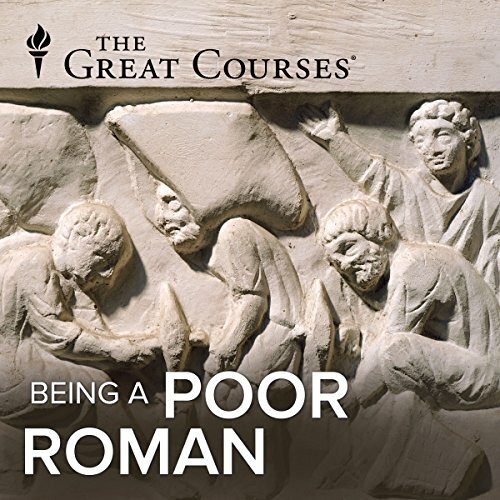 However, that presentation adds to the doom and gloom of what life, as presented in this brief course, must have thrown at poor Romans two millenia ago.If you think living in poverty today seems bad - and it is - living in Rome 2000 years ago and in poverty made poor Romans almost beg for death to take them sooner rather than later.